In Concord, Massachusetts, Dr. Joseph L. Andrew, a retired physician and local historian, is descended from several Jewish colonists who battled the British during the American Revolution: Haym Salomon (left), Colonel Isaac Franks and Major Benjamin Nones. Read a fascinating article (Boston Globe’s Boston.com) on minorities who fought in the war. The American Revolution is 235 years old, but information on the country’s first patriots is still being brought back to life. The Sons of the American Revolution (SAR) and Daughters of the American Revolution (DAR) are lineage organizations and accept everyone who qualifies via lineage to patriots of the Revolution. Andrews, 71, is working to present the role that minorities – women, African-Americans, Native Americans, Jews and children – played in the battle for independence. According to the story, he says “The American Revolution is not just for white, British guys anymore. His guidebook, “Revolutionary Boston, Lexington, and Concord: The Shots Heard ‘Round the World!” is in its third printing and, 12 years ago, he founded Concord Guides Walking Tours, which provides two-hour warm weather walking tours of local landmarks. Not mentioned in most school books are those who wanted freedom but were slave owners, that many of the Minute Men were young teenage boys and that a number of native Wampanoag fought for the cause. The story touches on the Old Hill Burying Ground and John Jack, an African-born slave who died in 1773. He purchased his freedom and was an active member of the community before the war. 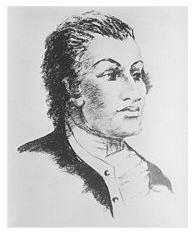 Andrews is connected to Jewish patriot-financier and member of the Sons of Liberty Haym Salomon. He organized loans from France, Holland and Spain to pay George Washington’s Continenal Army. Salomon escaped from the British before he could be hanged. He also has a two other Jewish Revolutionary War soldiers in his tree: Colonel Isaac Franks, an officer of Washington, and Major Benjamin Nones (Nunes) who fought against the British in the South and was captured in the siege of Charleston SC. But because only one Jewish patriot fought at the Battle of Bunker Hill, and none were present during the action in Lexington and at the North Bridge, the role of Jews is not explored in any detail at nearby Minute Man National Historical Park, which was visited by more than 1 million people last year, said Lou Sideris, the park’s chief of planning and communications. Andrews hopes interest in the Jews of the American Revolution will spark more research interest. His younger relatives are now interested in the Daughters of the American Revolution (DAR). “For years, Jewish people had the idea that they wouldn’t be welcome, but things fell much more wide open now,’’ said Andrews, a member of the SAR’s Old Middlesex chapter in Concord, and one of just two Jewish members of the organization in Massachusetts. Recently, he lectured on “George Washington’s Jewish Soldiers,’’ at his Concord synagogue, Kerem Shalom, and is working on another book – with the working title of “Moses and Miriam in America” – about Colonial life for the first Jewish immigrants. The story also mentions the 2002 program at the Bunker Hill Monument to recognize more than 100 Native American and African-American patriots who fought at the battle. Harvard professor Henry Louis Gates Jr. is overseeing the Black Patriots Project, which will be a theme of 2011’s annual Sons of the American Revolution conference.